Seven, as you know I'll be travelling to Turkey in September. The airport of arrival is Alanya on the Turkish southcoast. That's just below 37 degrees N. That should enable me to see Rukbat, right? I will actually be ravelling the whole time below the 40 degrees line except when we're in Istanbul. Since we also visit relatively sparsely populated Cappadocia I am hoping for nice, clear views with a lot of stars visible, something I have not in my native country/hometown. Do you have any tips? I'll be photographing digitally and my widest lens starts at 18 mm and is f3.5 iS. I currently use Google and Celestia. I fed the coordinates of Antalya into Skymap and generated this map for 9pm local time on 13th September. It's more or less due south at 10pm local time according to Skymap (Kath's instructions are for GMT). As Kath said, it's pretty low. You'll need to find somewhere dark with an unobstructed view of the southern horizon. Being on the south coast, you'll get some good unobstructed views out to sea. The higher up you can get, the better - the top of a hill overlooking the sea would give you the best vantage point. Look for the 3 bright stars Kaus Australia, Shaula and Antares, as shown on the Skymap map (the map is 65 degrees across), point your camera slightly to the left of them and try some long exposures. Oh, and take a pair of binoculars - they will help you get a better view of Rukbat. Have fun, and I hope you get some good weather. "Unfortunately" I am only on the south coast very early on (Sep 2-3) and at the end of our journey (near 15 Sep). Though anything lower than 40 degrees should do it, right? Albeit Rukat being very low, near the horizon. A hill isn't compulsory; just darkness and an unobstructed view of the south. Earlier in September you'll still get more or less the same view, but later. The map is valid for 10pm local time on 2nd September. Well, anything further south than about 40 degrees latitude is theoretically possible, but the further south you can get, the better. Seeing Rukbat 10 degrees above the horizon will be tricky - seeing it 1 degree above the horizon (although theoretically possible) will be extremely difficult. The timing is also important - you have a good 6 hour window from Antalya, but the timing shrinks as you get further north. If Rukbat only skims the horizon you may only have a few minutes to catch it before it sets - one cloud in the wrong place and its gone. Steven your map is wonderful...reminds me of the one you did for me a while back. Hans...I sure hope you get to see it...and with luck some decent photos to bring back with you. On re-reading my reply, I am being a little on the optimistic side. Hans, you will need to be right on the south coast to stand a chance of seeing Rukbat. Seeing something even 10 degrees above the horizon is tricky. Anywhere other than the coast and there are bound to be either houses, trees or low hills getting in your way; not to mention cloud, which of course I hope will not appear. Best of luck! Here's one for you then. How about looking at Rukbat from the Southern Hemisphere? Do we get a better deal at looking at it then the Northerners would ?? 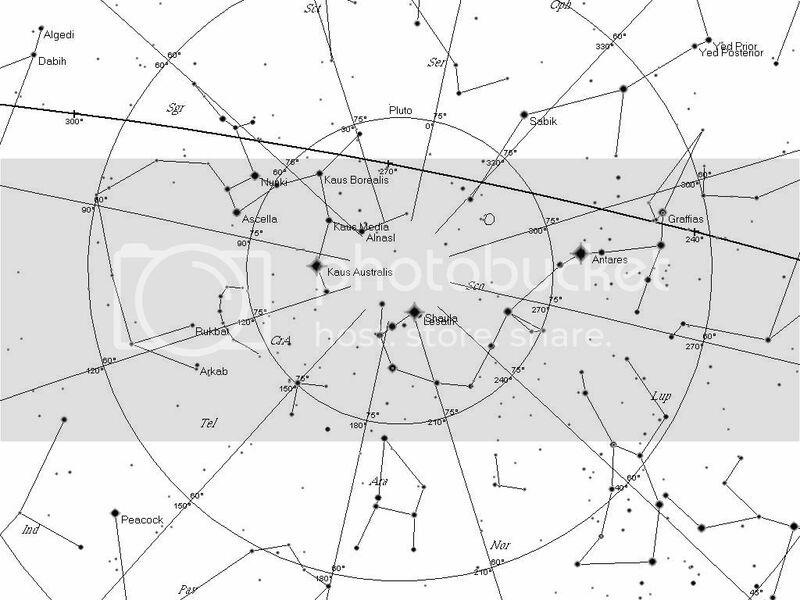 And if it's possible, a similiar star map to the one above but from our viewpoint not the northern version??? PLEASE with a cherry on top! Jube, you're one of the lucky ones. It's much easier to see Rukbat from the southern hemisphere. I can make you a map of Rukbat as seen from Sydney. In the mean time, though, you could hold Hans' map upside down. Although it will be the same here, dependent on weather (clear starry nights hopefully ) and if we can find an empty paddock/hill to go looking properly. 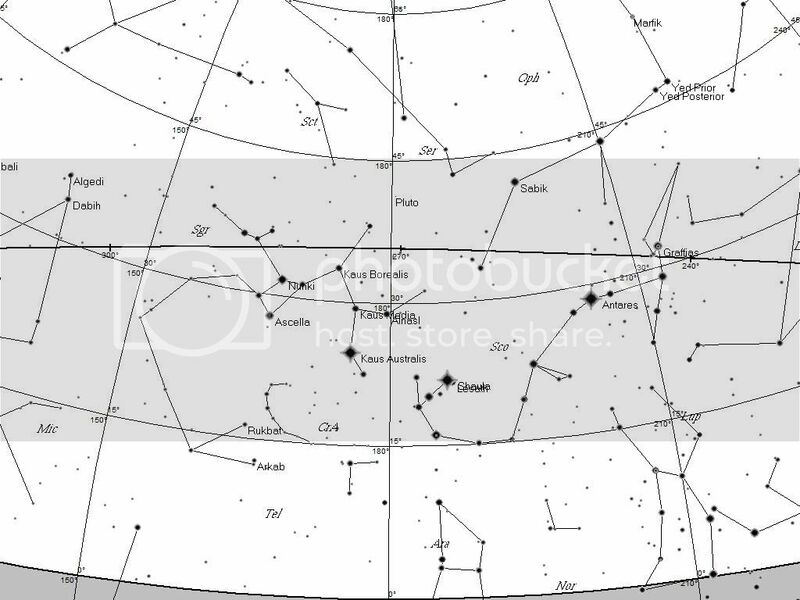 The map shows how the sky would look on 1st August at 9pm local time. To get this view you need to face south and then look straight up! The centre of those concentric circles is the zenith, right over your head. (The map isn't upside down because when looking straight up there is no right way up for the map.) You will find Rukbat much easier to see than Hans. You don't need a clear view of the horizon - just some darkness and a lack of clouds. The advice is the same as for Hans - look for those three bright stars first. Corona Australis, that little curve of stars just to the right of Rukbat, is a good landmark to look for. The map is valid for several weeks, since Rukbat should be visible to you for most of the late summer and autumn. Are we jealous or what? After saying that, I hope you get to see it too, Hans. Getting as far south and as high off the ground as you can, on the south coast is your best chance. Another wild idea: At what time of day will you be flying in and out of Turkey? If you happen to have a night flight and a south facing window, it would be worth having a look as you are approaching or leaving Turkey. Your height above the ground (and above the clouds!) will give you an advantage (if your window isn't too dirty). Alas, Stephen, as our flight schedules are planned now there are no flights during the dark hours. Did you read Spacedog's mind? That's what he said!